1. 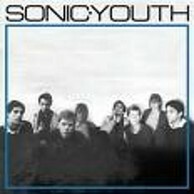 Recorded in late 1981 and released in 1982 on their own DIY-label Neutral, the 'Sonic Youth' e.p. (some called it a mini-LP, twas always mid-price on vinyl) was one of many truly indie records released in the New York scene in the era we could call post-punk. The sleevenotes are better on the history than I will ever be, as the writers were there, and I wasn't. 3. Amid all that the band called Sonic Youth formed, Edson's notes reveals that he first met Moore when he was in a band called The Coachmen (who you'd imagine were a Nuggets-inspired act?). Edson, a female keyboard player attached to a famous artist (Ann DeMarinis), Kim Gordon and Moore were the initial line-up of the band. Edson was also in Konk (2004 saw the release of Soul Jazz compilation 'The Sound of Konk') who were influenced by Brit acts like The Pop Group and Pigbag and were closer to the mutant disco vibe. This is Sonic Youth, but it isn't quite Sonic Youth. The keyboard player was replaced by guitarist Lee Ranaldo, who had a Soho loft in which the band rehearsed (before hitting on the idea they could rehearse live). Edson brought something different to the band - his notes point out a certain chemistry the Youth never explored when Moore played bass. Edson played some gigs with them, often wearing a baseball cap that Gordon thought made him look "heavy metal", and recorded this e.p. before leaving the band to pursue Konk - eventually drifting into films and television (credits include Stranger Than Paradise, Ferris Bueller's Day Off, Howard the Duck, Miami Vice, Platoon, Walker, Good Morning Vietnam, Eight Men Out, Strange Days and Homicide: Life on the Street amongst others). 7. The e.p. concludes with the instrumental 'The Good and the Bad', just under eight-minutes long it's likely this stretched on inifinitely live and is probably the place Youth-epics like 'The Diamond Sea' and 'Expressway to Yr Skull' developed from. I wouldn't have said the later Youth-material sat well with much post punk, since it was the next step-on, but 'The Good and the Bad' and all of this e.p. sits well alongside p-p-material from the 70s and 80s, round up the usual suspects: Swell Maps, Scritti Politti#1, The Raincoats, The Fall, The Slits (more Peel Sessions' Slits - both bands could/couldn't play conventionally and so it came out unconventional), Wire, Gang of Four, Josef K etc. 8. I do wonder what the Youth would have been like if they'd pursued more of the directions here, or if Edson had stuck around, or if Moore had switched to bass. 'Sonic Youth' hints at many possibilities and makes it clear why Moore & co have other projects on the go; as Holger Czukay said, "An index of possibilities!" I'm not sure what a whole album with Edson would have been like, it might have sucked, but with events the way they went, it's all a bit theoretical.